They're baaack! Catch the action for the first time or relive the ups and downs that come with fame as Vince, Eric, Drama and Turtle take you on a whirlwind ride through the high-stakes world of Hollywood with Entourage: The Complete Series. 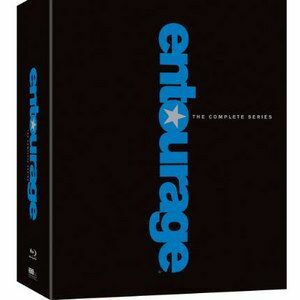 The perfect holiday gift for HBO fans, Entourage: The Complete Series on Blu-ray ($299.99) and DVD ($249.99) streets November 6, 2012. The set is boxed in a stylishly cool, black casing and features all 8 seasons along with more than 6 hours of bonus content and is the first time seasons one through five are available on Blu-ray. - "Meet the Newest Member of Entourage"
Created and executive produced by Doug Ellin and loosely based on the experiences of his good friend, Academy Award nominee Mark Wahlberg (who's among the series' executive producers), Entourage takes a none-too-serious look at the day-to-day life of Vincent Chase (Adrian Grenier), a hot young Hollywood actor, and the inner circle of friends he's brought from his hometown in Queens, NY: manager Eric (Kevin Connolly), half-brother/actor Drama (Kevin Dillon) and enterprising pal Turtle (Jerry Ferrara). The series also stars Jeremy Piven who garnered three Emmy Awards and a Golden Globe for his portrayal as Vince's agent Ari Gold, Rex Lee as Lloyd and Perrey Reeves as the long-suffering Mrs. Ari. Returning guest stars include Scott Caan as Scott Lavin, Emmanuelle Chriqui as Sloan, Beverly D'Angelo as Ari's business partner Babs and Debi Mazar as Vince's publicist Shauna. Along with Ellin and Wahlberg, the series is executive produced by Stephen Levinson, Denis Biggs, Ally Musika and Rob Weiss. Entourage Trailer #2: Vincent Chase and His Boys Are Back!